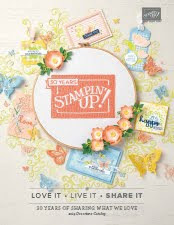 I just fell in love with this stamp set. Each image is so adorable, and this one has to be my fave! I love the tenderness these two share. 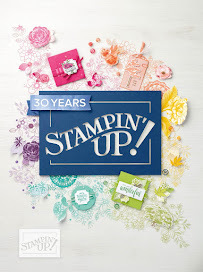 I used the background stamp Bokeh Dots and the Stamparatus to create the background. When lined up horizontally I was able to step the Stamparatus plate down 2 holes and have the stamp line up perfectly. 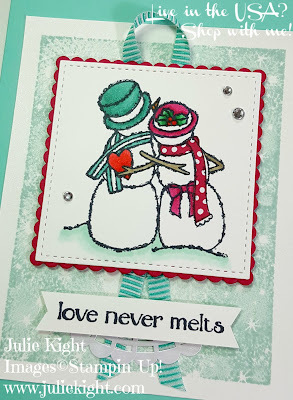 I used the Stampin' Blends to color the snow couple, but a used a fun technique for the snowwoman's scarf. I first stamped the couple stamp onto a piece of DSP (Designer Series Paper) and then I just cut the scarf out. I used glue to put it onto my image. Don't forget I have a Facebook live each week on Thursday @ 3pm MST. Hope to see you there!